When I first started reading Nineteen Seventy-Four, the first book in David Peace’s Red Riding quartet, I thought that he was something of a James Ellroy wannabe. But as I got into the book I stopped thinking that and decided that he was original, and the style was compelling. By the end of the quartet I was satisfied that it all worked in conveying the mood, the emotions and the action. 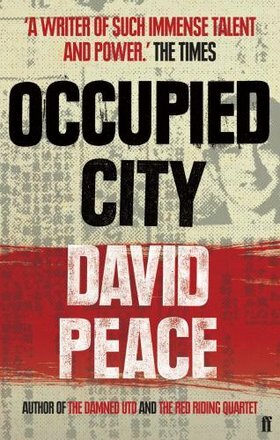 It wasn’t necessarily easy – the word “bleak” is used a lot in relation to David Peace – but I think that the use of different perspectives at different times in an unfolding story was important in delivering the whole effect. That story is backgrounded by the police investigation into the Yorkshire Ripper murders, but it deals with overwhelming corruption and evil that seem to be an integral part of that landscape. So it was with some anticipation that I moved on to the Tokyo trilogy, set in a post-war Tokyo dealing with the aftermath of defeat, where the physical destruction of the city is matched by the destruction of society’s structures and norms, and by the physical and mental decay of the people having to face a wrenching change in their reality. The first book in the trilogy, Tokyo Year Zero, is based on a real case, and tells the story of finding a serial murderer of women, from the perspective of a police detective. Again, it is not an easy book, but the style brilliantly conveys the mind and fears of Detective Minami as his discoveries bring together his own past and the murdered women and their murderer. So that was good, and it was one of those books that improve on reflection. Which brings me to Occupied City. Again, it is the story of deaths in Tokyo, and is again based on a true story of a massacre and robbery using methods linked to wartime research into chemical and bacterial weapons. The framework for this book is twelve stories of the events, told from the perspectives of twelve people with an involvement in them, and is apparently similar to the approach in the Kurosawa film Rashomon (which I have not seen), and also to a Japanese tradition of a ghost-story-telling game. Wherever it came from, I found the device for linking the stories to be obscure. Bleakness is here, and collapse, both personal and of society, is pervasive, but I felt that this book somehow lacked the energy of the quartet and of Tokyo Year Zero, possibly because the different stories were too fragmented. What does come through in a sad and compelling way is the corruption and duplicity of the rulers of the city, of both the occupiers and occupied, in their willingness to accommodate evil, and the implication that little has changed in this respect when we look at our world in our time. The writing style is even more extreme in its use of repetition and of typography. Whereas I found this worked in the earlier books, it tended to be more of a distraction in this one. David Peace is bleak, and his writing is not easy, but it can be rewarding. I will try his other books, GB84 and The Damned United, and I do have the Red Riding DVDs to watch. This entry was posted on Thursday, July 15th, 2010 at 5:07 pm and is filed under Books, Crime, Reviews. You can follow any responses to this entry through the RSS 2.0 feed. You can leave a response, or trackback from your own site.